My birthday was Tuesday. Everything was going well until we came home from celebrating with friends. We called and called and Greta was nowhere to be found. She has been known to be a bit of an escape artist in the past so Engineer hopped in the car and drove around our neighborhood calling for her. It was because of her that we constantly checked the fence line to make sure the dogs couldn't get out. We never saw this coming. She made no indication that she found a place to get out of the fence and we saw no place where she could get out. Then he drove down the busy street behind our new home. He didn't drive far before he saw something in the road that he prayed was anything but Greta. As he came through the door I was frantically saying, "Did you find her? Did you find her?!" He slumped over the banister and with tears in his eyes nodded. I doubled over and just kept asking if he checked to make sure it was her and that she wasn't breathing. He had. We both started sobbing. Greta, Diva's dog, no, more than just her dog, her best friend and constant companion was gone. And Diva was at camp, blissfully unaware. Y'all, if you have had a beloved dog you know what a blow it is when they leave you from natural causes, but to have a dog in the prime of their life suddenly taken from you, it is devastating. We had never had a dog like Greta before and may never again. She was the best dog (aside from her wanderlust) ever. Period. Best personality. Best temperament. Best dog. Ever. 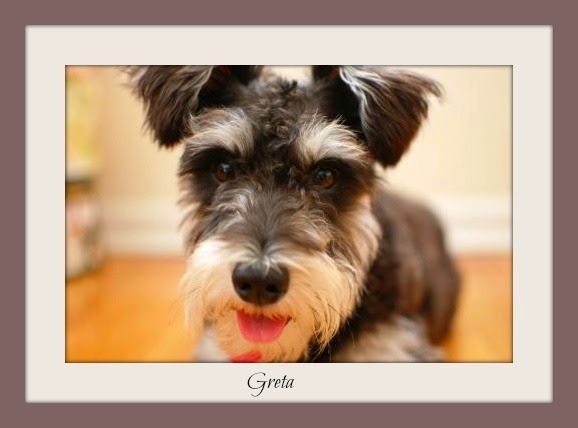 As a dog owner, I was deeply saddened by the loss of Greta and the impact that would have on our lives. As a mother, having to tell Diva that when she got home from being gone for a week, that her loyal buddy, that little bundle of energy and joy that slept with her every night and watched expectantly as she returned home from school each day, would not be there waiting by the door broke my heart in two. I cried for days over her loss and Diva, who only found out yesterday upon her return, has only a couple of days to grieve before she is gone again on a mission trip. If you are a praying person, please pray for Diva. She needs peace and comfort. Last week's menu went down the toilet for obvious reasons. We will endeavor to do better but without Diva here and a grey cloud still lingering over the house's mood, we may be winging it again. I grew up in the country with no fences and a major highway right in front of the house: 155. We have lost a lot of dogs over the years to that road. Each one was a heartbreak and each time we vowed, "never again". But it still would. We never once let our dogs out with our leashes or yard runs, so when they would escape, one way or another, they would just bolt, briefly enjoying their freedom. One of the worst I can remember was my brother's dog, Elroy. Think Frasier's dog. Same look, personality, etc. He deeply loved that dog. Mom, Jamie, and myself had gone to Canton for the day and left the dog at home with my oldest sister, who was also visiting (I was around 12-14 at this point and all my siblings had moved out of the house). We had a great day (one of the best memories of my brother comes from that day). We stopped by the store my mom worked at and found out we had a message waiting for us. My sister had called. We saw my mom look back at the car my bro and I were still sitting in and Jamie just knew. One of the few times I've seen my brother break down. It was a long drive the rest of the way home. We buried him in the backyard and Jamie actually got a small granite tombstone made for him. A lot of people say you should just go out and get another one right away, but I think that's a terrible idea. First off, you can't just replace a dog. My nephew's dog was accidentally hit my his mom (with him in the car, no less). It was HIS dog and quiet devastating to the whole family. She rushed right out and "replaced" her....and he resented the new dog and never accepted her. Healing takes time and friendship grows. I am so sorry for you loss and will definitely pray for your whole family. I know people that think the loss of a pet as no big deal, but those of us that know better, a pet is family. Love you guys! Thank you for that. It is quite difficult to know what to do in the situation where a child is the main caretaker for a particular dog. We had the fleeting thought of replacing her with a puppy as well, but it would only mask the pain. And Diva needs time to grieve, we all do. We love y'all!!! I know how hard it is especially when they are so young! We will continue to pray. Greta was wonderful! Thank you Ms. Sheryl for your prayers. Thank you Ms. Erica, it is quite the loss indeed. Thank you for your thoughts Ms. Melissa. Oh I'm so sorry for your loss. I'm hope your sweet girl can find some peace. Thank you Miss Helen. Diva is getting better every day; she just needs time. This is so sad. We lost our dog of 12 years last May and it still hurts. Praying for your family. We sill reminisce about our old dogs and you are so right, the pain is still there no matter how much time passes. Thank you for your prayers. Oh Friend! My heart breaks for you all! especially Diva. I know that if anything happened to my furbabies I'd be completely devastated!! Good dogs are hard to find and Great Dogs are even rarer! I'll be praying for Diva as she heads off on her next trip! Thank you for your prayers. Great dogs ARE rare and she was one of the greatest. Oh I am so sorry to hear this. Dead of a pet is incredibly sad. I lost so many pets living in the country. Still makes me cry to think about it. Engineer said the same thing. He had lost so many dogs to roads, coyotes, etc. while growing up in the country. He also said that's why it is good to have a pet, to learn to deal with grief in a healthy and safe environment.